Ron Rash’s newest novel utilizes the dual nature of the best of Southern literature. Above the Waterfall is told through the voices of two protagonists, one reflecting Southern noir; the other the voice of poetry. Each tells a compelling story from differing perspectives, male and female. To be a Southerner is to be steeped in the tradition of tales told on the front porch, and Rash is a master of catching the voices of those storytellers and bringing then to life on the page. Do not dismiss this as just a Southern novel. Its themes of love and friendship, sin and salvation, the traditional versus the modern are universal. The writing is authoritative and mesmerizing. It is a combination of prose and poetry that resonates with the voices of the people and the mountains in which the story is set. Rash’s use of just the right word captures the ethos of the place and transports the reader into a tangible world. Les is the sheriff of a small town in the mountains of Western North Carolina. Less than three weeks from retirement at age 51, he must still deal with the scourge of methamphetamine labs and a fish kill in a stream at the local resort. A man who is always looking at the dark side, he is not without sin, having received small kickbacks from local pot dealers for years. Becky is superintendent of the local state park. At 43 she and Les are trying to be an item, accomplices, as Les says. Nature and the poetry of Gerard Manley Hopkins help in her attempt to escape the memory of seeing her teacher shot dead when she was just 13. For a time she lived with an eco-terrorist who, had he not been stopped, would have killed many people. It is the healing power of nature that enables her to ease her demons. Their stories coalesce in the person of Gerald, an old farmer with a bad heart. His wife dead and his son killed in Afghanistan, he wants nothing more than to see the land to survive and be open to all. He loves fly-fishing and wants to fish above the waterfall where the stream is stocked and privatized for the paying customers of the local resort built on the old Tucker place. When someone dumps kerosene into the stream, killing all the fish, he becomes the prime suspect, and Les must weigh what seems to be irrefutable proof against Gerald’s assertion and Becky’s unassailable faith that he did not commit such a heinous crime. In what he has called “my most optimistic book,” Rash explores our need to belong, to be a part of humanity. Becky compares the trail left by an otter leaving the water to the famous handprint in the Lascaux Cave. The print from some ancient artist says, “I was here.” Wonder is part of being true to the world, and the healing properties of nature have the power to save Becky and Les. But nature, especially in the majesty of a waterfall, can also be a force of destruction. 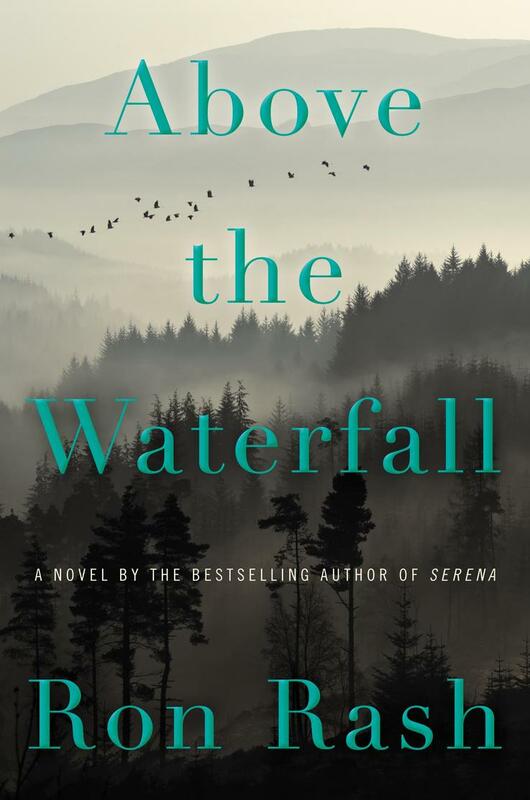 On one level Above the Waterfall appears to be a simple story of working out the ramifications of two major crimes, a meth lab and the poisoning of a trout stream. In the sure hands of Ron Rash, the story far exceeds that simplistic description. Doubt, betrayal, faith, love of land and people, and confronting one’s nightmares merge into a story of unparalleled power and splendor, a story far more than the sum of its parts. Ron Rash is the author of five previous novels, including Serena, a 2009 PEN/Faulkner Finalist, plus four collections of poems and six collections of stories. Burning Bright won the 2010 Frank O’Connor International Short Story Award. Now teaching at Western Carolina University in Cullowhee, NC, Rash has won the O. Henry Prize twice.